Cribbs played quarterback in college and twice both rushed and passed for over a thousand yards in a season. He went undrafted in 2005 and signed as a free agent with the Browns. Converted to wide receiver, Cribbs primarily returned kickoffs as a rookie, averaging 24.3 yards on 45 returns and scoring one touchdown. He averaged 24.5 yards and scored another TD in ’06, also catching 10 passes on offense. What he lacked in exceptional speed he made up for in sound running instincts. 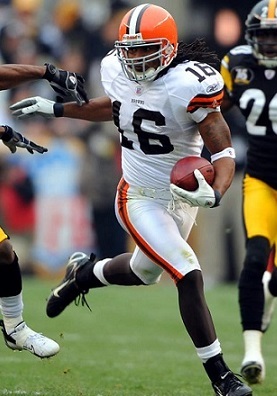 Having returned just seven punts in his first two years, Cribbs added that responsibility in 2007. Browns went 10-6 to finish second in the AFC North. Cribbs followed up in 2008 by averaging 25.2 yards on 44 kickoff returns with one TD and 8.1 yards returning 28 punts, and also led the club in tackles on special teams. In ’09, he received first-team All-NFL as well as Pro Bowl honors after averaging 27.5 yards on 56 kickoff returns, three of which he returned for touchdowns, and 11.9 yards on 38 punt returns that also included a TD. While used more at wide receiver, the results were less impressive, although he ran the ball 55 times for 381 yards (6.9 avg.) and a score. In 2010, for the first time in his career Cribbs failed to return a kick for a touchdown and had a down year overall but had a stronger season in 2011 that included a punt return TD as well as his best pass receiving season, with 41 catches for 518 yards (12.6 avg.) and four touchdowns. He averaged 27.4 yards on kickoff returns and 12.0 running back punts in 2012 and received Pro Bowl recognition but was released by the Browns in the offseason and signed with Oakland. The Raiders cut him during the 2013 preseason and he caught on with the New York Jets, but his season was cut short by a shoulder injury. He appeared in six games with the Colts in 2014. Overall, Cribbs returned 426 kickoffs for a 26.1-yard average and NFL career-high eight touchdowns (along with Leon Washington) and 222 punts for an average of 10.7 yards and three TDs. 387 of his kickoff returns, for a 25.9-yard average, and 195 punt returns, for an 11.0 average, came with the Browns, as did all of his touchdowns on returns. Cribbs also caught 110 passes for 1175 yards and seven TDs and rushed for 808 yards. He received consensus first-team All-NFL honors once and was named to the Pro Bowl three times.